Be the first to share your favorite memory, photo or story of James "Jim" . This memorial page is dedicated for family, friends and future generations to celebrate the life of their loved one. 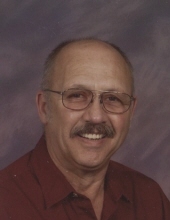 James "Jim" Robert Sliper, 76, of Great Falls, went to be with his Lord and Savior on January 29, 2019. Visitation will be at the O'Connor Funeral home on Sunday, February 3, 2019 from 1:00 PM - 3:00 PM. On Monday, February 4th, interment will be at Highland Cemetery at 11:00 AM and the Memorial Service will follow at 12:30 PM at Northwest Family Fellowship. Jim was born in Baker, Montana on August 26, 1942 to Carl and Anna Mae Sliper. Jim was married to Alida Little and four children were born to this union; Boyd, Coleen, Bart, and Joe. In 1985, Jim married Carol Love and became step-father to Janell, Karyn, and Rich. Jim graduated from Darby High School, and was a member of the United States Air Force from 1960 - 1964. Jim continued his military career in the Air National Guard, retiring as MSgt. in 1994. Jim served the Guard as an aircraft mechanic. After retirement, Jim continued to work as a Resident Advisor at the Pre-Release Center and lastly, he loved to help Rich with farming, especially bailing hay. In his early years, Jim played Cowboy Polo and was a skilled horseman. His other hobbies included hunting and he was an avid reader. Jim served in the Chouteau County and Cascade County Sheriff's Posse, and in the Montana State Sheriff's Posse. He held the office of President in each of these organizations. Jim was preceded in death by his son, Bart, and his brother, Wade. Jim will be greatly missed by his wife, Carol, his brother, John (Sydney) Sliper, his sister, Connie Sliper and his children, Boyd (Marlys) Sliper, Coleen (Jack) Rosenberg, Joe (Kate) Sliper, Karyn (Stefano) Dona, Rich (Carolyn) Love and Janell Love, and his 10 grand-children. In lieu of flowers, the family asks for memorial contributions to Northwest Family Fellowship, Great Falls Rescue Mission, or Dave Roever Evangelistic Association. To plant a tree in memory of James "Jim" Robert Sliper, please visit our Tribute Store. "Email Address" would like to share the life celebration of James "Jim" Robert Sliper. Click on the "link" to go to share a favorite memory or leave a condolence message for the family.